Cerise favors functional pirate’s clothes, worn with a Taldan dandy’s flair, but is just as comfortable in a courtier’s gown when the situation calls for it. Beneath such fashionable clothes, however, she still wears a simple blouse and trousers tucked into hard-heeled boots, ready to slip free of the gown and draw her rapier-an action many of her enemies fail to recognize before it’s too late and she draws their blood. 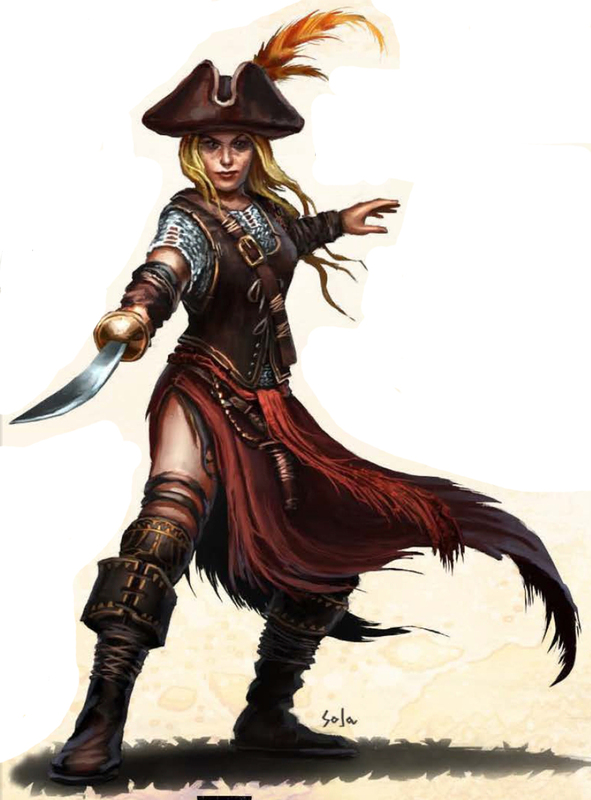 After a falling-out with her disgraced father in Taldor, Cerise Bloodmourn traded her family name for a stolen galley out of Cassomir called the Come What May and the life of a pirate on the Inner Sea. When her husband, the down-on-his-luck pirate captain named Daerius Wynnt, perished in battle with the Taldan navy, Lady Bloodmourn came to the Shackles and joined Tessa Fairwind’s fleet. She capably served the mistress of Quent before attaining her own title. 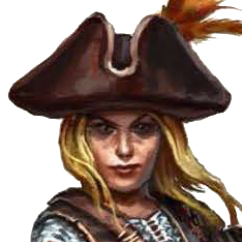 Now she regards her seat on the Pirate Council as a new form of nobility, the difference being that her name and reputation are of her own making rather than the product of a family name which means nothing to her anymore. Lady Bloodmourn still has a noble’s gift for currying favor and building alliances. She plays the game of social graces and secret betrayals as well as anyone; she harbors ambitions of her own, though she keeps her own counsel.